Los Altos Eichler owner Tracy Gibbons engaged in tug of war with her canine companion, Martha. San Mateo Highlands Eichler owners Fred and Jean Leonard. 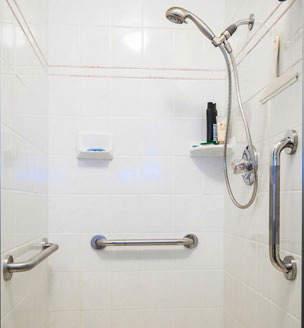 In the Leonards' shower: grab bars at every turn. "This is really kind of a community," Fred points out, "because the only houses here are Eichlers. And one of the things we have in common is we all love the indoor-outdoor thing." 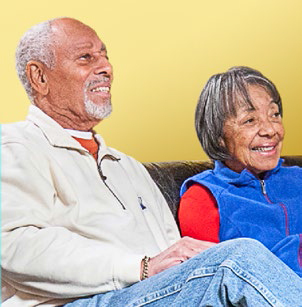 "So [when we bought our home]," added Jean, "we thought we'd stay here for a while." Forty-seven years later they have no plans to leave. The Leonards, now in their early 80s, like keeping busy with their favorite pastimes. Now that their grandchildren are grown and they're no longer "chief babysitters," Fred goes fishing a lot, and both enjoy playing tennis. Fred and Jean also appreciate the logical floor plan of their house; every room has its purpose—each has their own office, for example—yet there's still plenty of space left over for the grandkids. When asked what it was about their home that most lends itself to aging in comfort, both enthusiastically chimed in, "No stairs!" The Highlands is also home to spirited 90-year-old Leo Schlocker, who finds that his Eichler suits him as well now—he loves being engaged with his garden railroad hobby out back—as it did when he was young and raising his three children. When Schlocker and wife Phyllis bought their Eichler in 1963, they immediately liked the house because it looked so accessible. "It was nice and level, and we had four bedrooms, two baths," he recalls. "Our kids liked that too." The Schlockers' floor plan, which was unusual at the time, and still is compared to the standard three-bed/two-bath configuration commonly seen in tract homes, is a point of convenience for many Eichler owners. Today, the extra room can house live-in caregivers or relatives. In Schlocker's case, his son, a retired electrician, lives with him. 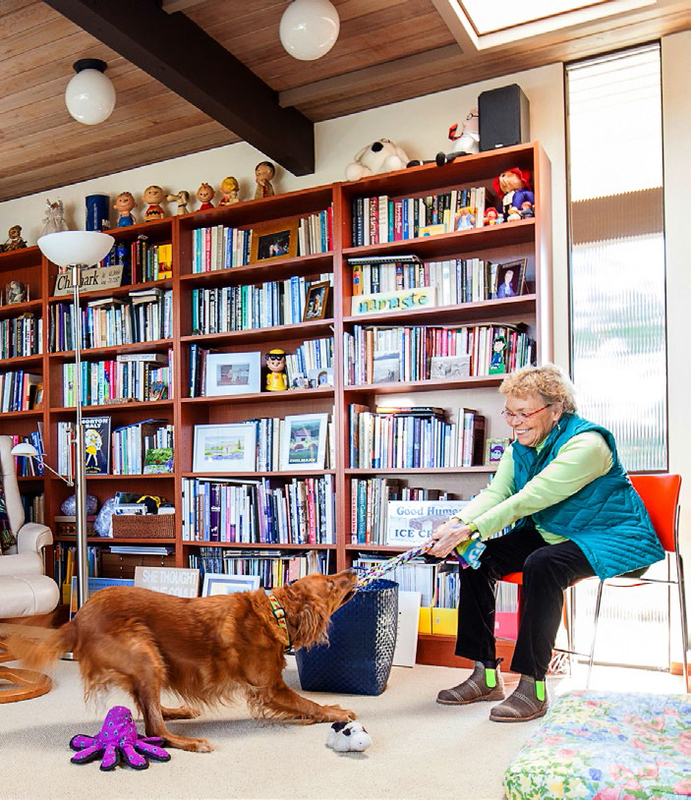 Los Altos Eichler owner Tracy Gibbons found herself making age-related moves as she edged into her late 60s and began having knee trouble. Her first relocation was from a townhouse to a single-story ranch home, both in Mountain View. 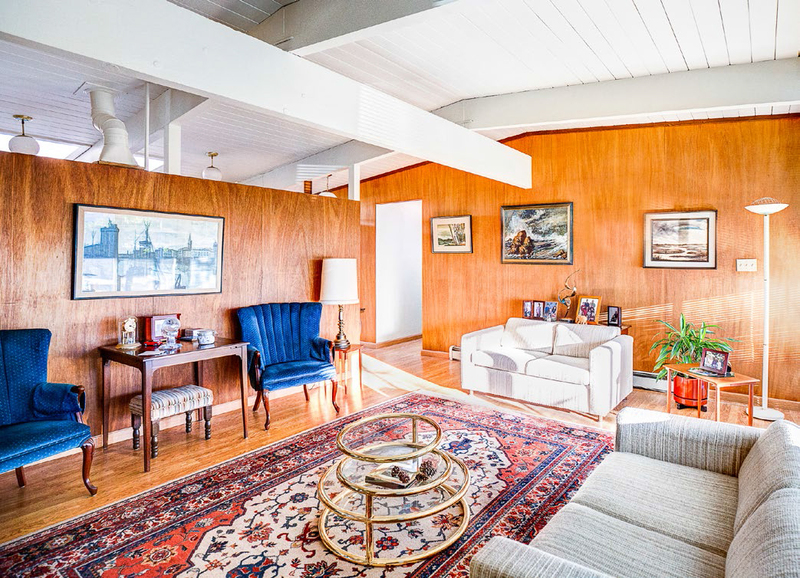 That move was precipitated in part by Gibbons' experience assisting her elderly parents move from the family home that her architect-father designed and had lived in for over 50 years. That house, a custom mid-century modern split-level home in suburban New York, had both of the bathrooms located upstairs. It also had a staircase with open risers, with one side completely open to the living room. After Gibbons' mom needed knee-replacement surgery and was no longer able to navigate the stairs, Gibbons helped her parents move into an extended care facility. "That's when I got clear really fast that I didn't want to be having that sort of moving experience in my late 80s," says Gibbons. 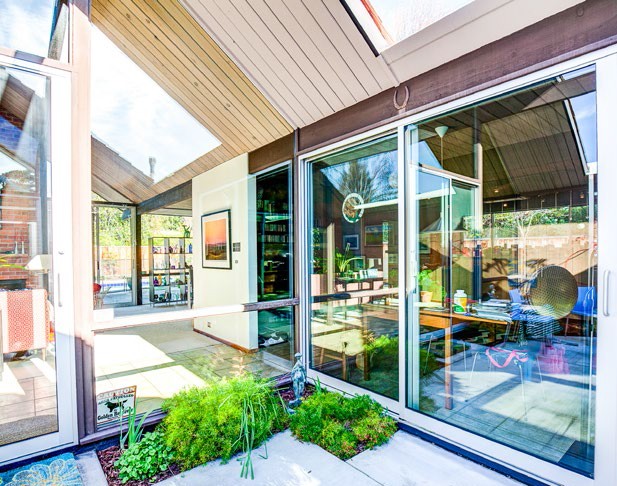 For Gibbons, she found ultimate peace at home when she bought her Los Altos Eichler in 2012, and then completely refurbished it using aging-in-place design. Most of her improvements were in the bathrooms. There, Gibbons replaced the sunken tub with a shower by raising the floor, installed a seat in the shower and a hand-held shower head that reached to the seat for sit-down use, installed new shower flooring of small mosaic tiles with a flat finish (additional grout lines dramatically improved the non-skid feature), widened the shower door to ADA standards, and replaced all three commodes with ones of "comfort height." She also changed out all the windows throughout the house with double-glazed glass.